The PCS group of companies provides sophisticated information processing and communication solutions to a broad range of customers located along the eastern seaboard of Australia and within the South Pacific region. The PCS HQ in Granville, NSW Australia. The group began in 1971 as Photoset Computer Service and was one of Australia's first fully computerized typesetting bureaus, later expanding services to colour separations and graphic reproductions. This resulted in Photoset Computer Service - who had now abbreviated their name to PCS - becoming one of the largest pre-press bureaus in the graphic art industry. The company diversified into computer data processing services and software development in the late 1970's and by the mid 1980's the company had developed into a large scale computer sales and support company through its association with NEC. When desktop publishing became a reality , PCS shifted its focus to corporate and government markets , providing them with desktop publishing and network system solutions. Over the years the company has re-structured its business to anticipate and meet market needs as they arise. For example , the company successfully established a technology wholesale division in 1988 and a telemarketing division in 1993. 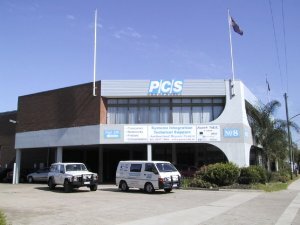 The graphic arts division was sold to Australian Consolidated Press in March 1992 and at that time the company changed its name to PCS Australia. In recent times PCS has also become one of Australia's premier networking system consultants and suppliers - implementing large scale networks for clients such as Planet Hollywood chain of Restaurants and the NSW Health Department. Indeed , PCS is still involved in servicing the Health Department's networking system which now involves over 7000 computers and more than 100 local area networks. PCS Australia consistently rank among the TOP 500 privately owned companies in NSW. It is the ability to provide information technology and communications solutions to organizations of any size which led Novell ® and Microsoft ® to appoint PCS as their OEM Reseller - a status which PCS retains to date. Today PCS has grown to provide computer products and services to a wide range of businesses. The group generated revenue of twenty million dollars ($20,000,000.00) during 1997 and PCS employs nearly 40 people in Australia and New Zealand. Wholesale Technology, which distributes to a network of over 500 value added resellers.